ALL-NEW ARC! ALL-NEW JUMPING-ON POINT! 'THE FIST AND THE STEEL' starts now! Many years from now, Earth's immortal master of war and the world's deadliest intelligence operative fight side by side. 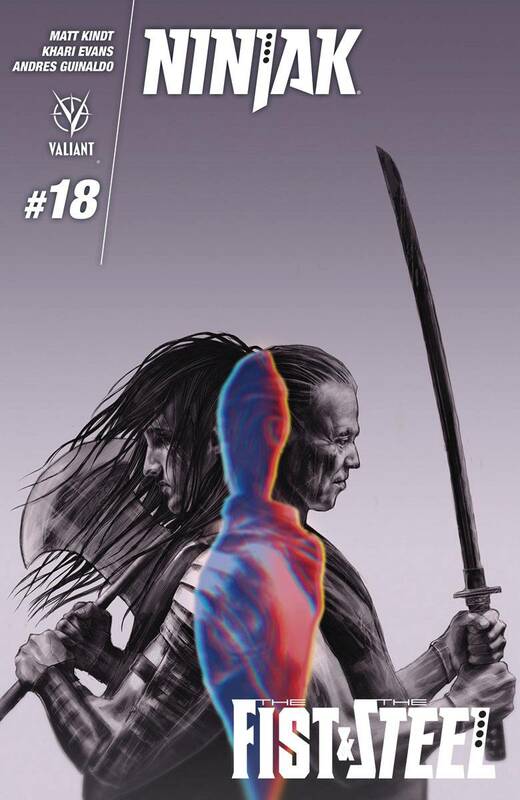 As was foretold in the BOOK OF DEATH, an aging Ninjak and Eternal Warrior are fated to spend their days as humanity's guardians, protecting it from the myriad threats that loom over the horizon of Earth's future. But when the ultimate menace rises to obliterate all traces of life, can Colin King and Gilad Anni-Padda - Ninjak and the Eternal Warrior - cement their status as the Valiant Universe's greatest heroic duo?or will their legacy go up in flames? Plus: Back in the present, the unthinkable has happened to Ninjak and his fellow MI-6 agents that survived the horrors of the Deadside! Infected with an aggressive and lethal cancer from his exposure to a noxious parallel dimension, Ninjak must race against the clock for a cure before he makes a permanent trip to the realm of the dead! Jump on board the steel-shattering adventures of Valiant's number-one super-spy here as New York Times best-selling writer Matt Kindt (4001 A.D.) and explosive artists Khari Evans (IMPERIUM) and Andres Guinaldo (Justice League Dark) read from the BOOK OF DEATH?and bring the full weight of the future crashing down on Ninjak and the Eternal Warrior!